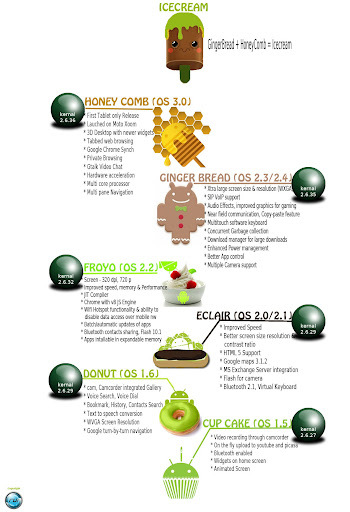 Up till now Android 2.3 (better known as Gingerbread) has been the flagship OS of all Android devices. Recently a survey was conducted by Google which ensured once again that Gingerbread still remains the number one Android platform and has increased its lead from second place considerably. The 2.3 version powers no less than 58.6 percent of all Android-operated devices right now, while the runner up, 2.2 Froyo, only runs on 27.8 percent of Google powered gadgets. Those two were in the lead a couple of months ago as well, but the difference between them has increased from just over 25 percent to a whopping 30.8 percent. The second runner-up is Android 2.1 Eclair, with a 7.6% market share. Honeycomb is in fourth place having a 3.4% market share. Ice Cream Sandwich, the latest (and greatest, if I may say so) Android version is unsurprisingly only fifth in this share ranking. Unsurprisingly, because at the momentl there are only a couple of available smartphones running Android 4.0, ICS . On the other hand, the next Google developers report (or maybe the one after that) should see an important change in rankings, as more and more smartphones and slates running Ice Cream Sandwich are due to be officially launched this year and in some cases even as early as spring. For the time being, it should be noted that Ice Cream Sandwich has gone up from 0.6% a month ago to a whole percent right now, managing to tie the 1.6 Donut and surpass the 1.5 Cupcake. These two have still got teeny-weeny market shares, even though I personally don’t know anyone with a gadget running either of the two Android versions any longer, rumour has it that both Donut and Cupcake are set to become extinct very very soon. Low cost Androids to hit half a billion by year end ! !